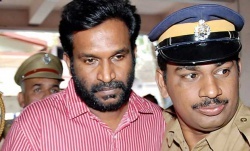 The Kerala High Court today dismissed the bail application of solar panel scam accused Biju Radhakrishnan in connection with the death of his wife in February 2006. Dismissing Biju's bail plea, Justice S S Sateeshchandran said having regard to the facts and circumstances of the case and considering apprehensions of the prime witness, his eldest son, Biju was not entitled for bail. However, the High Court directed the magistrate to expedite commital proceedings within four weeks. The sessions judge has been directed to take steps for expeditious trial which should be completed within five months, the court held.